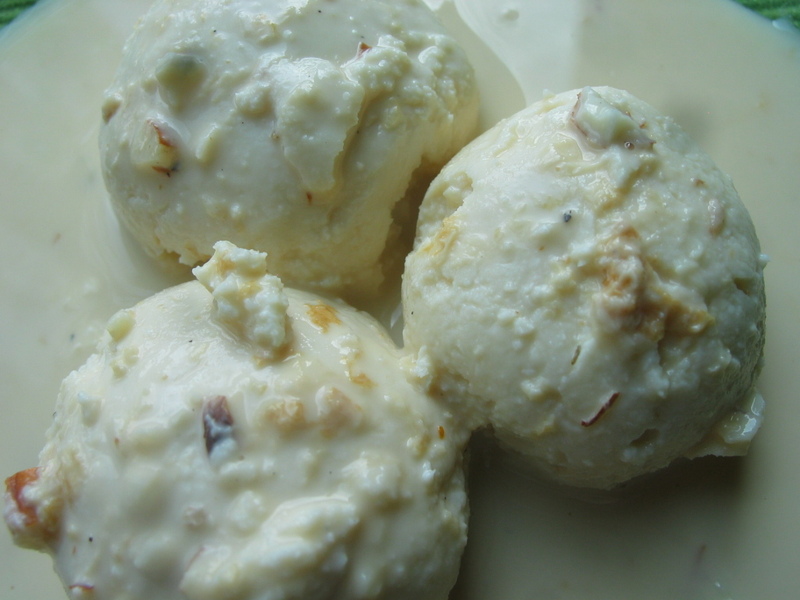 This months ICC recipe was Rasmalai. 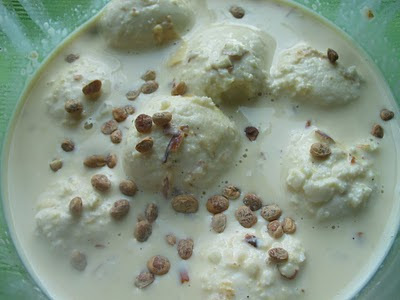 There are only very few people who doesn't like rasagulla and this cousin of rasgulla is my all time favorite. As i was a little unwell because of the change of weather i was not posting anything for a week but thought of making rasgulla cheered me up and finally ended up making it y'day but was very tired to post it and missed the deadline.But still thought of posting it anyways today. Boil Two Litres of milk and let it cool. Refrigerate the milk for 12 hours. The next day or after 12 hours, remove the thick layer of skin/ paal adai/meegada formed over the milk. Now boil the milk, when the milk boils, add vinegar. wait for a minute or two. the paneer will start floating on top and the whey water will stay on the bottom of the vessel. Now with a muslin or a cotton cloth, filter the paneer and pour 2 cups of water on it, to remove the sourness of vinegar and then tie it well and let it hang on for one hour, till the whey water drops out. As we have tied and hanged the paneer in muslin cloth to let out the whey water, wait for an hour and squeeze them well. remove from the cloth and shift to a broad vessel. Now just prepare the paneer, as we knead the dough for chapathi/roti, in the same way knead the paneer, for 5 minutes atleast, till you feel it dont have much moisture content in it. now add a spoon of maida flour to the paneer and make it as small small ball's remember the balls will become double in size after putting it and boiling it in sugar syrup. so make a medium size paneer ball's. with 2 litres of milk you can prepare 12 or 13 paneer ball's. In a wide-bottomed pressure cooker, add three cups of water and eight table spoons of sugar. let it boil. Now when it boils, add the paneer ball's one by one on to it. dont afraid of the ball's getting broken. if you have kneaded the paneer well, it wont get broked. let it get pressure cooked for 10 minutes in slow flame or for 2 whistles. Now let the steam get out and open the cooker and see the double-sized paneer ball's. slightly press each and evry ball to emit the excess sugar syrup. When you are starting to prepare sugar syrup. start making milk syrup/rasa side by side. Have one litre of milk in a wide bottomed vessel and let it boil and get reduced into half of the quantity. add eight table spoons of sugar and mix well. add crushed cardoman to it and mix well. put the paneer ball's into the rasa/milk syrup. cool it down and refregirate it. Serves chilled with chopped nuts on top. looks so delicious feel to taste some.inviting shots.. I love rasmalai..Thanks for sharing this super-delicious rasmalai recipe..Nice clicks!! Delicious and creamy..looks so perfect. Beautiful - well done recipe!! New to me but looks like a lovely dessert to enjoy. I was about to say I saw another recipe for rasmalai when I figured Icc is going on. This look lovely. I love rasamalai too; nice instructions !!! they've come out great !! Love rasmalai, its always a challenge for me...I am gonna try ur method, sounds very helpful and thanks for sharing,dear.